Sporty and her best friend, Harley, are two young horses who play basketball for Horsecitty’s professional team called the Shorthorns. They’re also superheroes. In this short story, Sporty and Harley are called upon to track down a valuable artwork that went missing under suspicious circumstances. But amidst enigmas, red herrings and a mysterious note, will the heroes find the culprit? If you like horses, if you like superheroes, if you like adventure and aliens, then you’ll love Super Sporty and the rest of the Horsecitty gang. Signed, Anonymous is a standalone Super Sporty short story. It is available for free across all ebook platforms, so go ahead and grab yourself a copy today! This entry was posted in Uncategorized and tagged children's book, children's books, Ellie Firestone, Signed Anonymous, Super Sporty Short Stories, Super Sporty Short Stories: Signed Anonymous, Super Sporty Short Stories: Signed Anonymous by Ellie Firestone, super sporty short story. Bookmark the permalink. ← Wonder why you should appear on The Segilola Salami Show? 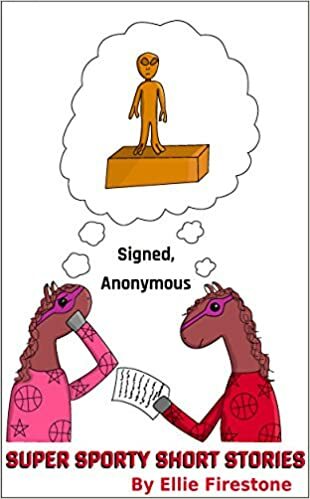 Here is the link to a review of Signed, Anonymous from the “I Read What You Write” book blog: https://ireadwhatyouwrite.wordpress.com/2015/11/23/book-reviewsuper-sporty-short-stories-signed-anonymous-by-ellie-firestone/. Thanks for posting this, Segilola!